Enjoy the benefits of a glass and tiled conservatory roof combined. Choose your preferred type of glazing and enjoy a tiled roof house extension that feels like any other room in your home. Take a closer look at the Ultraroof, a tiled roof house extension that will give you total control over where the light falls in your brand new room. Our range of Ultraroof tiled roof house extensions are perfect for homes in Kenilworth, Warwickshire, Leamington Spa and their surrounding areas. Like its close cousin, the Livinroof, the Ultraroof is a hybrid system that includes glass and tiles. 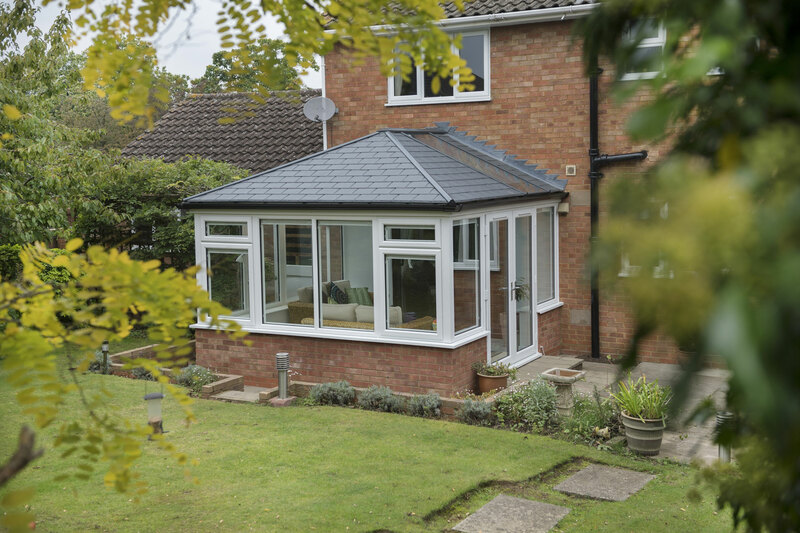 It’s the perfect choice for homeowners torn between choosing a glass or tiled roof house extension – as it seamlessly delivers the benefits of both. Our manufacturing partner for tiled roof house extensions is Ultraframe, the UK’s market-leader when it comes to conservatory roof systems. Fox Windows is an accredited Ultra Installer and has extensive experience of fitting these systems. Create stunning external sightlines that will catch the attention of anyone who comes to visit you at your home in or near Kenilworth. Super-Insulated columns can be installed in a flat or fluted style and can even sit on top of dwarf wall. Choose these columns and enjoy thermal efficiency levels far higher than brick. Your tiled roof house extension will need to work as part of your home. We’ll help you achieve the right design by helping you choose from our range of tile colours, which includes Terra Brick, Carbon Grey and Harvest Brown. Did you know that you can also design your extension online using our brand new tool? Where Do You Need The Light? When you choose an Ultraroof extension from Fox Windows, you’ll be offered two choices. You can ask us to fit full-height glazing to let in more light; alternatively, you can opt for Velux Windows. Our team will be able to discuss the advantages of both, which come with their own unique set of benefits. Renovate your roofline if you want to hide your guttering and streamline the appearance of your tiled roof house extension. We can offer a range of beautiful decorative cornices that work with almost all Ultraframe roof systems (our curved option works with each of them and will give you even better design flexibility). Homeowners use their extensions, orangeries and conservatories year-round. These rooms frequently function as living areas and sometimes bedrooms. Our tiled roof house extensions feature a vaulted plastered ceiling that will improve comfort and turn your new space into an area you love spending time in. The Ultraroof has been fire tested as a complete structure by Ultraframe. Warrington Fire - an independent third party organisation - also assessed this tiled roof house extension to ensure it was safe. Ultraroof satisfied all requirements and was certified as fire safe. Ask for more information when calling. Are You Thinking of Buying a Tiled Roof House Extension? The homeowners we work with in Kenilworth – and its surrounding areas – want to install a tiled roof house extension because it’s the cost effective option. Moving is expensive and can be stressful. An Ultraroof extension is comparatively cheaper and will add market appeal to your property when the time comes to sell. A tiled roof house extension can function as a new living room or lounge area. We can even help you build an open-plan kitchen extension, as our Ultraframe systems are designed to overcome restrictions imposed by planning permission guidelines and building regulations. Ask for advice when contacting the Fox Windows team. Your new tiled roof house extension save you money by stopping you from moving. Because of the thermal technology used in your super-insulated columns, vaulted plastered ceiling – and other areas of your roof – it will reward you with lower running costs. The additional space you’ve created will also make your home more marketable. Fox Windows offers an extensive range of Ultraframe products. We install tiled roof house extensions, glass systems and solid ones too. We are a registered Ultra Installer and accredited members of Which? Trusted Trader. We have successfully completed projects in your local area for many of our customers. Visit our Projects page for examples. Explore our tiled house extension roofs in VR and get a competitive online quote in minutes. Ask for more information about the Ultraroof today. We can talk you through its specification and provide guideline prices over the phone. If you want prices only at this stage, you can get a tiled roof house extension quote within minutes by using our brand new design tool. For your convenience, Fox Windows works with customers in Kenilworth, Leamington Spa, Warwickshire, Stratford Upon Avon, Rugby, Coventry and the surrounding areas. Take a look around an Ultraframe extension, orangery or conservatory using our VR tool and make a buying decision from the comfort of your armchair.